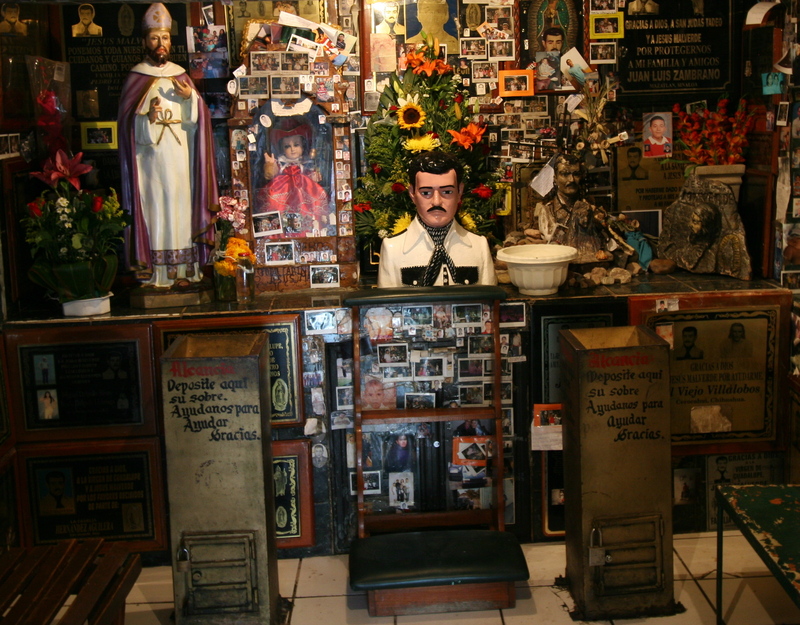 A bust of Malverde, the "Narco Saint", sits at the center of a concrete chapel in Mexico. Money given in thanks to Malverde adorns the walls and ceiling of one room. 'La Doña' watches over the Malverde chapel. In the city of Culiacán, Sinaloa in northern Mexico, drug traffickers flock to a small unofficial church, paying homage for their success in the criminal underworld. For Mexico's drug traffickers, this shrine is a mecca, where a mustachioed saint has become a symbol for the cartel culture. For 20 years, Doña Tere has sat at her rocking chair inside the chapel to this Robin Hood like figure, Jesus Malverde. Legend has him as a bandit from the 19th century who stole from the rich to give to the poor. These days, he's co-opted by the drug lords along the Pacific coast who are making load runs to the U.S.
La Doña tells the story of how the shrine came to be. It's not a pretty story. In the late 1970s, a local man was shot in the stomach seven times. No one ever says why or who shot him. "He begged Malverde to allow him to flee the bar where he was shot and get out onto the street to ask for help," she said. "He promised Malverde he'd take care of his shrine ever after." He lived and by the look of things, he's held up his part of the bargain. The small concrete chapel is shrouded in green light from the tinted windows. There's a bust of the mustachioed Malverde in the center. Plaques adorn the walls. Thank you for a successful trip to the United States, someone wrote. Thank you for getting me out of prison, another person wrote. For $5, La Doña will sell you a leather scapular bearing the mustachioed face of the “narco-santo”, or drug lord saint. Or you can just post a photo of yourself posing with the bust and add it to the hundreds of faded photos taped to the walls. For those who don't want to show their face, there is an alternative: Hire a band to sing a good ol' fashioned “Sinaloan corrido” (country song) as gratitude. The singers don't want to talk. Instead, they slip right into their song: An homage to Malverde. "I'm going to sing a “corridor” of a story that is true / About a generous bandit who robbed wherever he wished. / Jesus Malverde was a man who helped the poor. / That's why they protected him when the law came looking." His fame is well established in Mexico, and it’s growing here in the United States. A shrine to the saint sits in a small cave along a known drug mule route south of Tucson, Arizona. In Phoenix's Latino neighborhoods, young men sport Malverde medallions like Catholic scapulars. He even shows up in a blog about "the taco lifestyle" in Los Angeles. "Thank you for getting me out of prison," the plaque reads. Phoenix police detectives and Border Patrol agents see those same medallions on kidnappers and border bandits they take down throughout Arizona. Down here in Sinaloa, he's more voodoo than Catholic saint; and a jealous one at that, says La Doña. With Malverde, there's a price to pay. "Here's the thing with Malverde. You ask for your miracle, and whatever you promised (him in return), you'd better fulfill," she said.